I've become infatuated with tube pencil skirts. They add a little something different to the standard jeans and tee mom casual uniform. The stretchy knit kind that you pull on and off have made summer dressing so easy. Granted I've only made this discovery about a week ago. In that time, I've already purchased four of the same skirt in different colors and patterns. I like cheap (price not quality) clothes and I usually go to thrift stores to get them. I purchased the skirts on Amazon saved myself some time and gas. I'm very leery of actual cheap clothes floating about in the fast fashion world. Wash it and that's the last time it can be worn. I took a chance on these because I was so thirsty. It's too hot for jeans and not enough shorts plus a closet full of clothes that no longer fit. I still haven't rid the closet of my pre-weight loss stuff. I've creating the perfect storm for shopping. These skirts aren't super high quality but they are pretty darn great for wardrobe building. The stitching is tight and even with no loose threads and it's delicate cycle washing machine friendly. I don't dare throw them in the dryer. A $20 skirt can only take so much. With secondhand clothes, I'm almost always guaranteed a real deal look at how the garment will look post wash. I can't be so sure with a new item. 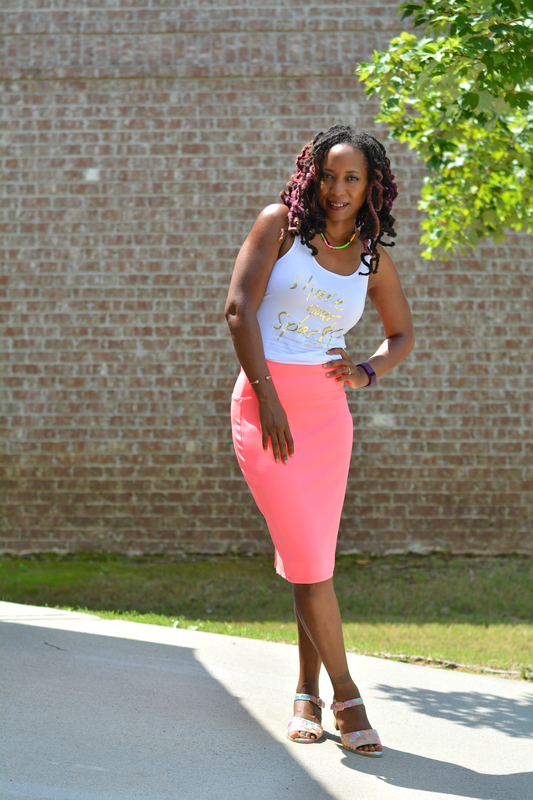 I love how versatile the skirt is and consider it quite the bargain. High waist. Stretchy. Dress it up. Dress it down. Wear with sneakers. Wear with heels. Fun colors and patterns. It's a year around skirt. I'm seriously patting myself on the back about the find. 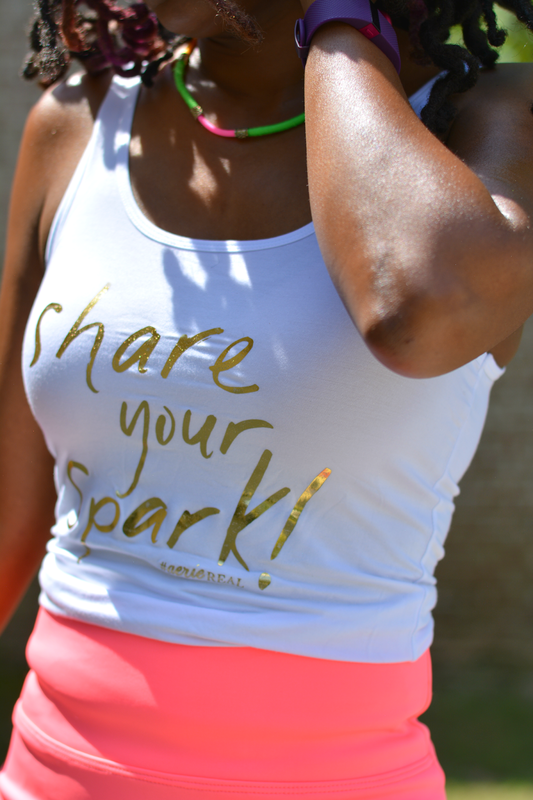 My "Share Your Spark" tee was gifted to me by Aerie who also provided me with a much needed bra. 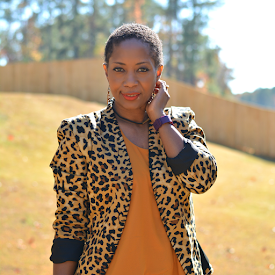 My bra size has also changed and I'm experiencing challenges finding the inflated breastfeeding, deflated post-breastfeeding, weight gain, weight loss size. 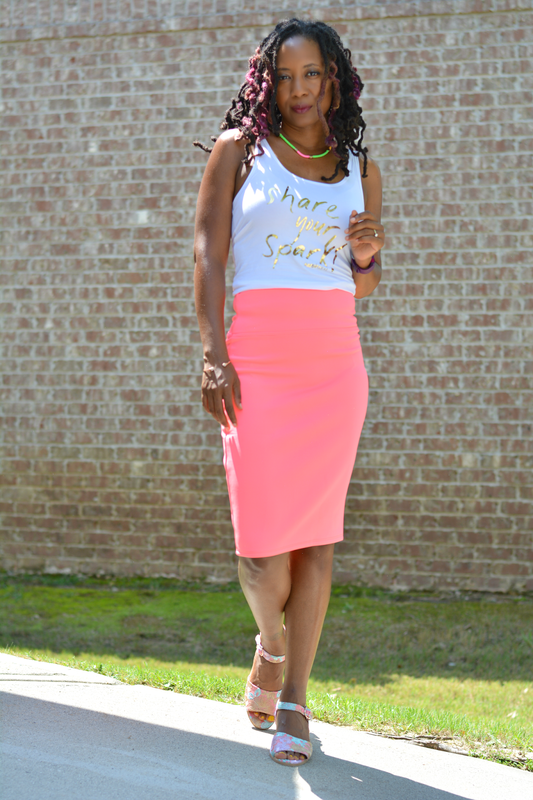 Wear what you like with confidence and you will always be in style, on trend and fashionable. Attitude is everything. The end. I think this is my first no thrift style post ever. Nothing is thrifted. Free, frugal, and diy are still represented though. 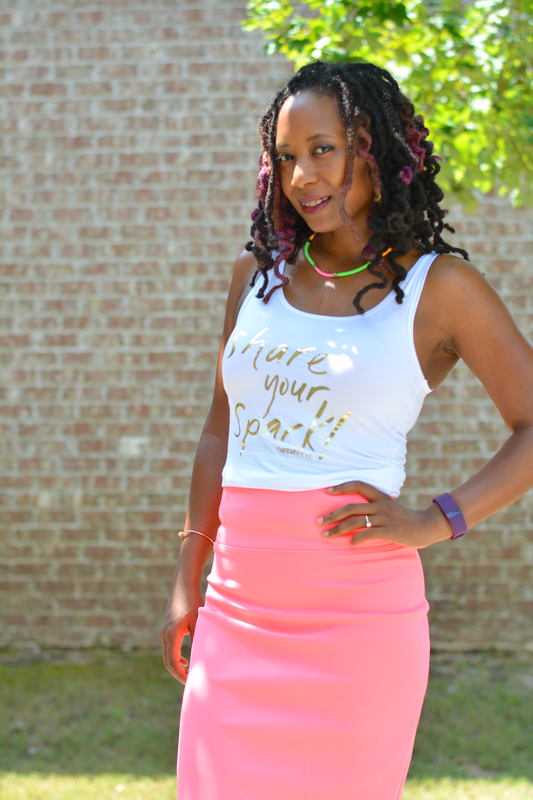 What's your spark? Feel free to share it in comments below.